I learned a lot in the Truth of War project like reading The Things They Carried and watching Ken Burns. The Things They Carried is a book that is compiled with many different short war stories. In this book, there is a lot of talk about dying and how hard it was for the soldiers in Vietnam. That’s what stuck with me the most. They talked a lot about tunnels, landmines, Napalm, and how many people they killed. After reading about the crazy things that happened we watched a series of documentaries to gain more knowledge about the history of the war. In Ken Burns, we learned about how it was a fight for or against communism and how it started. We also looked at how that affected the United States and what the United States did for Vietnam, if anything. It was really interesting to see how kids were drafted and what it was like in the 60’s. In the US all men could have been drafted to go fight in the Vietnam War and some people would protest and burn their draft cards. Of course, that didn't really work so some people went to seek refuge in Canada. Even after these soldiers got home from fighting people wouldn’t welcome them because they had killed people and people didn't approve of that. It was also really cool to see how against the US was about communism even when they were not very educated on what it was. They were the first to judge. I really wanted to see things close to home, so learning about the struggles in the US was very interesting. 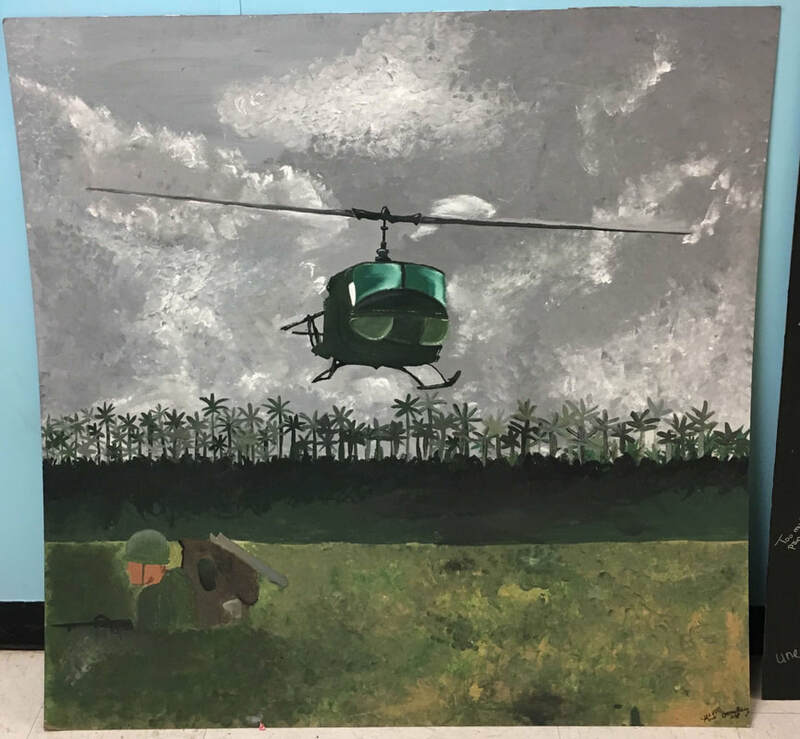 To show what we learned in this project we created an interactive exhibition to immerse the community in the Vietnam War. We created multiple rooms to show different perspectives of people affected by the war. The rooms we had were Living Room, Soldiers on the Battlefield, Soldiers Emotions, Vietnam Perspective, America Divided, and Retrospective. In the Living Room, we wanted to show what a typical family looked like in the 60’s, what they talked about and what they thought about everything that was happening. In the Soldiers on the Battlefield, we showed what it was like to be fighting in Vietnam. We showed what traps were used and what happened when someone was injured. In the Soldiers Emotions room, we wanted to make people feel like they were missing their families and how mentally taxing it was for the soldiers. They couldn't talk to the ones they love, they could die at any moment and their friends were already dead. We showed an interview with a veteran explaining how much war changed his perspective on life and how awful it actually was. In the Vietnamese Perspective room, we wanted to show how tough it was to be in the war even if you weren't a soldier. People in Vietnam were killed or burned because they were in the way or they “supported the cause”. We wanted to show people that people were affected that shouldn't have been involved in the first place. In the America Divided room, it showed all of the protestants in America and the culture at that time. The last room was the Retrospective room. That room was honoring everyone who died in the War and what they did as memorials and things people did to mourn their loved ones. It was also a room to give feedback for our exhibition and what room people liked the most. I thought that all of the rooms were really amazing and they all told their own individual story. In this project, I think that I strengthened my project skills a lot in the first part of the project. In this project, I was a Project Manager and I had to learn how to balance everything well and I think that I accomplished that. I learned how to not get too stressed by not spreading myself to thin when I am doing a bunch of tasks. In the last two days of the project it got way more stressful and I was getting really frustrated with people and I would get really anxious if a room wasn't done. In the end, I learned that everything isn't my responsibility and I can let other people do some things as well. I always want everything to be amazing and so I make sure that it is going to be. That is the most stressful thing ever because if it doesn't go well you feel like it is your fault. It could partly be your fault but it also falls on other people. Another strength that I think that I could work on is taking on more writing responsibilities because I am not very good at proofreading and so I would just hand it off to someone else and that wasn't very fair to the people around me. Or if I actually proofread it, it would have definitely been wrong. In the end, I think I gained some experiences but there are more things that I can improve on in the future. This project changed my thinking because it showed me how much people are still affected by the Vietnam War. In this project, we just learned about the awful things that happened so we don’t know what it was like. We don't really know what they went through and how much it affected them in their later lives. I realized this when we interviewed a local veteran in the community and he started crying when he was talking about how taxing it was on him. It was really interesting to see how much it still affects his life now. After the exhibition, my parents were talking about the video and how they had a plumber one time who was in the war. They were talking to him and he started crying because he hated the thought of what the war made him do. Its crazy how much people just skip over the PTSD that veterans go through on a daily basis. It changed my perspective on how I look at people and what I say because one wrong thing could affect their day. It has made me a better person because I think about what the people in our community may have gone through in their lives and how easy we actually have it.